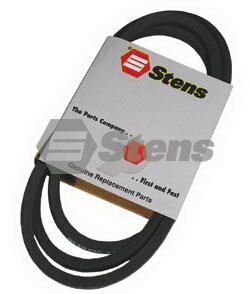 Lawn Mower Belt Replaces Part number 754-0369 and 954-0369. Fits Models: 22" self-propelled models 526R and 528B - Application: Drive - Length: 32 1/2" - Width: 3/8"
Belt Replaces Part Number 754-0370 and 954-0370. Fits Models: all 600 series 1990 and newer and 750 thru 769 series; 36", 38" and 42" cut - Application: Variable Speed - Length: 47 3/4" - Width: 5/8"
Belt Replaces Part Number 754-0371A and 954-0371A. - Fits Models: 42" cut side discharge - Application: Deck - Length: 74" - Width: 5/8"
Belt Replaces Part Number 754-374 and 954-0374. 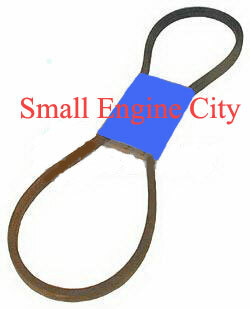 Timing Belt for 18" walk behind electric mower, Model 222 1990-1993. - Length 18-5/8" - Width 3/8"
Lawn Mower Belt Replaces Part Number 754-0433 and 954-0433. Fits Models: 38" cut 800 series - Application: Deck - Length: 69" - Width: 5/8"
Lawn Mower Belt Replaces Part Numbers 754-0439 and 954-0439. Fits Models: 46" cut deep deck 600 series riders and auto drive step thru frame lawn tractors 1999 and newer - Application: Deck - Length: 60" - Width: 5/8"
Belt Replaces Part Numbers 754-0440 and 954-0440. Fits Models: 46" cut deep deck 600 series riders - Application: Deck - Length: 99" - Width: 1/2"
Belt Replaces Part Numbers 754-0441 and 954-0441. Fits Models: 600 series hydrostatic riders 46" cut model 13AS6938131 - Application: Transmission/Drive - Length: 76 1/4" - Width: 1/2"
Belt Replaces Part Numbers 754-0443A and 954-0443A. Mower deck belt for rear discharge mower model 765. Length 91-3/16"
Belt Replaces Part Numbers 754-0446 and 954-0446. Fits Models: 800 series 2-speed garden tractors 1997 and newer (except auto drive step thru 1999) - Application: Transmission/Drive - Length: 44 1/2" - Width: 5/8"
Belt Replaces Part Numbers 754-0453 and 954-0453. V-Belt Used On Yard Bug. Width 5/8" Length 36-1/4"
Belt Replaces 754-0456 and 954-0456. Fits two stage snowthrowers, 2005 and newer. Length 28-5/8" - Width 3/8"
Lawn Mower Belt Replaces Part Numbers 754-0460 and 954-0460. FITS MODELS 959C, 979C, E979E AND 999C, REAR WHEEL DRIVE REAR DISCHARGE, 42" 1997 AND NEWER. - Width 3/8" - Length 39"
Belt Replaces Part Numbers 754-0461 and 954-0461. Transmission Belt, Fits 800 series Hydro garden tractors 1997 and newer. Width 1/2" - Length 78-1/4"
Belt Replaces 754-0465 and 954-0465. Fits models 400 and 500 series self-propelled walk behinds, 1998 and older. Length 35-3/4" - Width 3/8"
Belt Replaces Part Numbers 754-0467 and 954-0467. Transmission Drive, Fits auto step drive thru tractors 1999 and newer. Width 5/8" Length 90-1/2"
Belt Replaces Part Numbers 754-0468 and 954-0468. UPPER DRIVE BELT FOR 600 SERIES AUTO DRIVE MOWERS 1999-2003. Width 5/8" Length 41-1/2"
Belt Replaces Part Numbers 754-0472 and 954-0472. Deck, fits auto drive step thru lawn tractors with 42" decks 1999 only. Width 5/8" Length 83-1/4"
Belt Replaces 754-0474 and 954-0474. Deck Drive Belt, Fits auto drive step thru lawn tractors with 46" decks 1999 and newer. - Width 5/8" - Length 101"
Belt Replaces Part Numbers 754-0475 and 954-0475. DECK BELT TO LOWER ENGINE PULLEY FOR AUTO DRIVE STEP THOUGH FRAME ON 50" GARDEN TRACTOR. - Width 5/8" - Length 108-1/2"
Belt Replaces Part Numbers 754-0476 and 954-0476. Engine to Deck, Fits auto drive step thru garden tractors with 46" decks 1999 and newer with electric PTO. Width 5/8" Length 100-1/2"
Belt Replaces Part Numbers 754-0485 and 954-0485. Deck, Fits manual PTO auto drive step thru frame 42" lawn tractor 1999 and newer. Width 5/8" Length 97-1/4"
Aftermarket Belt Replaces Part Numbers 754-0483 and 954-0483. FITS SELF-PROPELLED FRONT WHEEL DRIVE MODELS 263, 264, 525, 528 & 529 MOWERS 2000 AND AFTER. Belt Replaces Part Numbers 754-0486 and 954-0486.Eng. to Deck, Fits auto drive step thru garden tractors with 46" decks 1999 and newer with manual PTO models 13A0604G401, 13AG619H022 and 13AI607H098. Width 5/8" Length 67"
Belt Replaces Part Numbers 754-0489 and 954-0489. Fits Models 25A-253N401 (2000) - 25A-201G000 (2000-20003) - 25A-201G352 (2000) - 25A201H7000 (2000) - 25A203L013 (2000) - 25A203N713 (2003) - Length 44-1/4" - Width 3/8"
Belt Replaces Part Numbers 754-0497 and 954-0497. FITS MODELS 13AABD4F401, 13AD60BG300 AND 13AG619H022, FOR 42" DECKS V- BELT PTO BELT. Width 1/2" Length 60"
Belt Replaces Part Numbers 754-0498 and 954-0498. Auto Drive 1999 and newer 42" cup deep decks. Width 1/2" Length 66-1/2"
Belt Replaces Part Numbers 754-0625A and 954-0625A. Fits Models 25A-253N401 (2000), 25A-201G000 (2000-2003), 25A-201G352 (2000), 25A201H7000 (2000), 25A203L013 (2000), 25A203N713 (2003) - Length 44-1/4" - Width 3/8"
Belt Replaces Part Numbers 754-0637A and 954-0637A. Fits Self-Propelled walk behinds. Length 31" - Width 3/8"
Belt Replaces Part Numbers 754-0642 and 954-0642. DECK DRIVE BELT FOR 54" AUTO DRIVE MODEL WITH ELECTRIC PTO. Width 5/8" Length 137-7/8"
Belt Replaces Part Numbers 754-0935 and 954-0935. DRIVE BELT FOR SP MODELS 352R AND 359R, TRACTION DRIVE FOR MODELS 640, 642, 646, 660 & 666 SNOWBLOWERS. 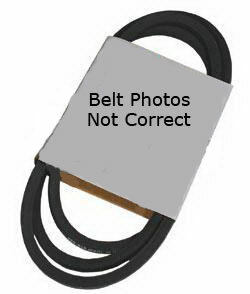 Width 1/2" Length 31"
Belt Replaces Part Numbers 754-04001 and 954-04001A. Fits Models: MTD 600 series lawn tractors (except auto drive step thru frame models) 2003 and newer WHITE LT15 and LT175 Application: Drive - Length: 69" - Width: 5/8"
Belt Replaces Part Numbers 754-04014 and 954-04014. Drive Belt fits compact snow throwers 2005 and newer. Length 27" - Width 3/8"
Belt Replaces Part Numbers 754-04032A, 954-04032A and 954-04032B. Fits models 400 and 500 series self-propelled walk behinds, 1998 and older. Length 35-3/4" - Width 3/8"
Belt Replaces Part Numbers 754-04033 and 954-04033. Deck Belt - Length 117-1/8" - Width 1/2"
Belt Replaces Part Numbers 754-04045 and 954-04045. Fits Models: MTD RZT-42 and 13AX605G755 Application: Deck - Length: 109" - Width: 1/2"
Belt Replaces Part Numbers 754-04048 and 954-04048. Fits model LT1024, 2005 and newer with 50" decks. Length 131" - Width 5/8"
Replaces Part Numbers 754-04060, MTD 754-04060B, MTD 954-04060, MTD 954-04060B. Fits Models: MTD Deck assembly "G" 2005 with 42" cut decks Application: Deck Length: 96 1/2" Width: 1/2"
Replaces Part Numbers 754-04062, 954-04062, Fits Models: 38" decks "F" 2005-2006 - Application: Deck Length: 77 3/4" - Width: 1/2"
Belt Replaces Part Numbers 754-04064 and 954-04064. Fits 2004-2005 Yardman, Yard Machine, Huskee Supreme with 46" H Decks. Length 68-1/4" - Width 5/8"
Belt Replaces Part Numbers 754-04077 and 954-04077. Fits Models: 14AK811P705 - Application: Deck - Length: 134" - Width: 5/8"
Belt Replaces Part Numbers 754-04122 and 954-04122. Drive Belt fits models 13AT605H718 and 13AX605H744 (2006) Length 90" - Width 1/2"